Want to create 1.9 million American jobs and add $265 billion to the economy? Upgrade our water and wastewater infrastructure. That’s the message of a new report from Green For All, in partnership with American Rivers, the Economic Policy Institute, and the Pacific Institute. The Rockefeller Foundation generously provided funding for the project. Every year, sewage overflows dump 860 billion gallons of untreated sewage into our nation’s waterways – enough to cover the entire state of Pennsylvania with waste one-inch deep. But investment in our nation’s infrastructure to handle stormwater and wastewater has lagged, falling by one-third since its 1975 peak. 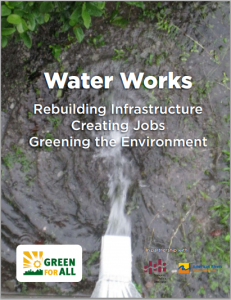 The report, Water Works: Rebuilding Infrastructure, Creating Jobs, Greening the Environment, looks at an investment of $188.4 billion in water infrastructure – the amount the EPA indicates would be required to manage stormwater and preserve water quality. That investment would inject a quarter of a trillion dollars into the economy, create 1.2 million direct and indirect jobs in related sectors and also result in 0.6 million additional jobs from increased spending in other sectors. Further, the report notes that this is the best moment to make the investment. With the recession creating a shortfall of 11.1 million jobs that would be needed to keep pace with the population and 9.1% unemployment, these are jobs that are critically needed. Moreover, the cost of financing these essential upgrades is at historic lows, and the still-struggling economy means much cheaper construction costs. Investing in green infrastructure approaches that more closely mimic natural systems is part of the solution – and further provides the additional benefits of reducing pollution of creeks and other waterways, saving energy, and increasing green space in urban areas. Continuing on this work, the Pacific Institute has launched a comprehensive scoping analysis of the green jobs potential in the water sector – one of the most important and least-well understood resource sectors in the United States. The project will provide a solid basis for understanding the extent to which sustainable water practices could provide pathways out of poverty for low-income communities; evaluate potential water-related green job creation where the necessary data are available; and develop a blueprint with community members and project partners defining essential elements of successful green job programs. Water scarcity and quality problems are poised to become one of the most prominent natural resource challenges of the 21st century for the U.S. and the world with consequences for economic, social, and environmental interests. Some of the looming challenges include continued population and economic growth, chronic underinvestment in maintaining existing water and wastewater infrastructure, declining aquatic ecosystems, and long-term climate change. The traditional approach to meeting these challenges have almost entirely relied on massive, centralized, capital-intensive infrastructure such as large dams and reservoirs, extensive levee systems, and far-reaching pipelines and aqueducts. However, a range of sustainable solutions are also available to meet these challenges. There is growing awareness of, and attention to, the potential for generating job growth, economic activity, and direct community benefits from sustainable water solutions. Yet too little detailed analysis of that potential has been done in order to really drive changes in investment patterns and fiscal priorities. This analysis will be completed in fall of 2012.